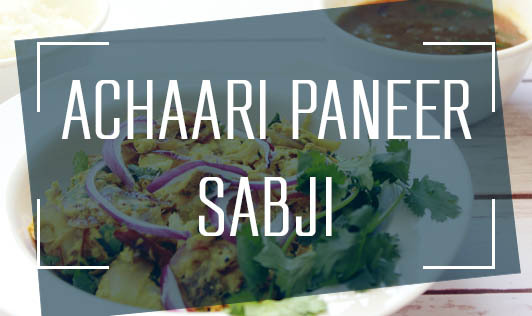 Achaari paneer is a delicious accompaniment, which abrosbs the flavors from the mixture of seeds used in the seasoning. A simple mix of curd, flour, and masala forms the base for this delicious cottage cheese recipe. Mix sauf, mustard seeds, methi, kalonji, cumin seeds, and hing together in a small bowl. Heat oil in a nonstick kadai and add the seed mixture to it. When the seeds begin to crackle, add the chopped onions and sauté till they turn slightly translucent. Make sure you don’t burn the seeds while crackling. Add the paneer, haldi, chili powder, and sanchal, and stir for a minute or two. Now add the curd, sprinkle maida, and mix together. Seasoned with salt and bring it to boil. Garnish with finely-chopped coriander and serve hot with rice or rotis. If the curd is sour add a teaspoon of milk while serving.